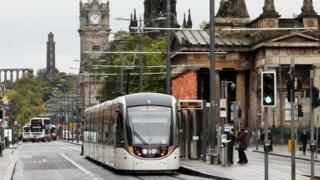 The Edinburgh trams inquiry will examine six million documents as part of its investigation into what went wrong with the project. Speaking at the first preliminary hearing, Lord Hardie, who is leading the probe, said it would not determine why the project went ahead. He also said it would not decide if anybody was legally responsible or financially liable. The trams project was delivered five years behind schedule and over budget. The inquiry was ordered by the Scottish government to investigate what went wrong. Lord Hardie announce the details of seven organisations that have been designated as core participants, outlining the progress of the inquiry so far and set out his process for conducting the next stage of the inquiry. During the hearing, Lord Hardie announced that Bilfinger Construction UK, Carillion Utility Services, Edinburgh City Council, DLA Piper Scotland, Parsons Brinckerhoff, Scottish ministers and Siemens had applied for and been granted core participant status. A decision by the city council not to revive its former arms-length transport firm Transport Initiatives Edinburgh (Tie) means it has not been designated a "core participant". The council said the decision not to revive the firm would have no impact on its ability to provide relevant information held by the company and its former bosses, and had been taken on the basis of cost. However, Lord Hardie said: "It appears that there is clear scope for a conflict of interest between the City of Edinburgh Council and Tie. "This is not least because the council has raised an action for damages in the Court of Session against Tie, which has separate solicitors, albeit I presume funded by the council, but that's perhaps something that can be clarified. "If councillors were not fully advised of the correct position, it might be prudent of the City of Edinburgh Council to reconsider these issues following a full and more balanced report than the one which was available on 20 August in effort to reduce any challenge that might impede this inquiry." Lord Hardie also raised the issue of conflict of interest in relation to the law firm Pinsent Masons. "As I have already mentioned there is clear potential for a conflict of interest between the City of Edinburgh Council and Tie, however there would also appear to be a potential conflict of interest involving Pinsent Masons," he said. "That potential arises in different ways." Lord Hardie said the firm was acting for Tie in a legal action against tram contract lawyers DLA Piper Scotland LLP while acting against Tie in the legal action pursued by the council. In addition, Pinsent Masons are representing both the council and contractor Bilfinger Construction UK Ltd at the inquiry, raising issues of confidentiality and loyalty, he added. "I want to be satisfied that both of these have been addressed to avoid any risk of challenge to the inquiry," Lord Hardie said. Lawyers representing the council and Bilfinger said disputes between the parties had been resolved while both will have entirely separate legal teams from Pinsent Masons. Lord Hardie has asked each of the core participants to consider conflict of interest and provide written responses to the inquiry by 27 November. He said his team was continuing to make good progress in line with the published order of events. The inquiry will examine why the project cost so much while delivering less than had initially been planned. Trams finally started running in May last year on the 8.7-mile (14km) route between the city's New Town and airport following six years of disruption. The total cost of the project was put at £776m - significantly over budget - despite the route being shorter than had originally been intended. The scope of the inquiry has already been extended so witnesses could be compelled to give evidence after some of them initially refused to co-operate. Edinburgh City Council has set aside £2m to cover legal costs. No time frame has been set for how long the inquiry will take.